Last week Defense Secretary Robert Gates announced drastic cuts across the military, totaling $78 billion over the next five years. Among those cuts were three hard hits to the Marine Corps. A 20,000 Marine drawdown will being in 2015. Development of the Expeditionary Fighting Vehicle was canceled. Production of the F-35B Joint Strike Fighter was delayed by at least two years and risks being nixed all together. 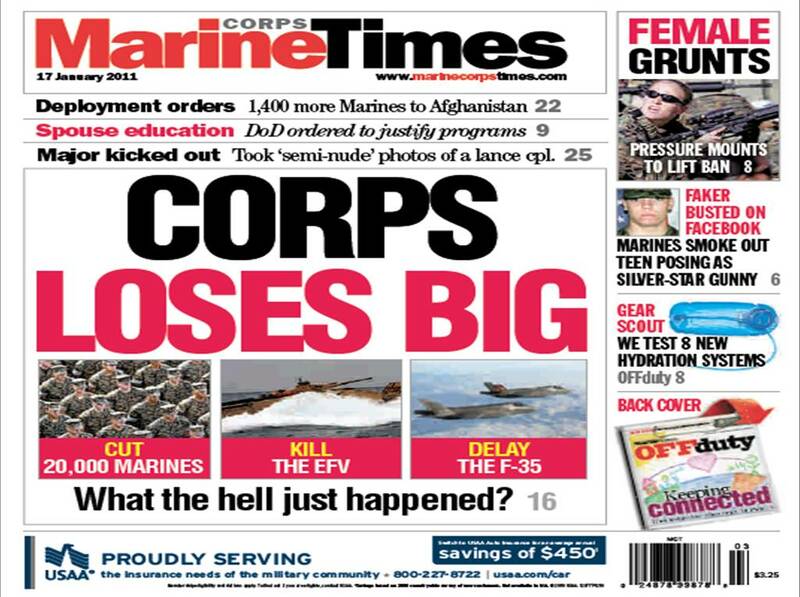 This week’s Marine Corps Times delves deep into the cuts. With the EFV scuttled the Marine Corps is without a next-generation ship to shore vehicle. With the F-35B delayed, an aging fleet of AV-8B Harriers, EA-6B Prowlers and the F/A-18 hornets will be pressed into service for even longer. And, with a personnel cut of up to 10 percent, competition among those vying for a career could turn cut throat. We lay it all out for you. To find out what the Defense Department’s belt tightening means for the Corps, you and your future, pick up this week’s Marine Corps Times on newsstands now, or subscribe here. Well I guess cutting scores are going to go through the roof. This is mainly a reply to SGT2111. You really need to read an ITS manual for the band before you catagorize them as “replaceable by an ipod” cutting the Marine Band is like cutting prom from high school: doable but then where would our force generation come from? They make recruiter’s jobs easier and at any time those Bandsman can become supply, Public affairs, MWR, etc. That and there’s just nothing like the real thing, baby! For everyone this gets to, be informed before making coments that piss your brothers off.